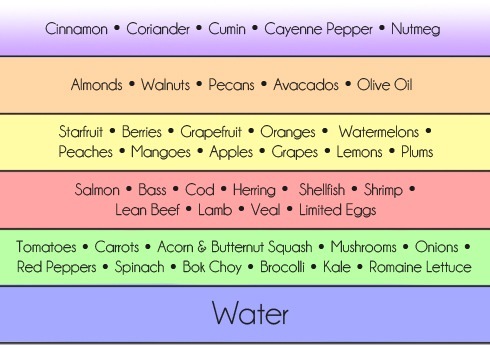 OK, here's the low down on the paleolithic diet and paleo food. Click here to check out part 1 about paleolithic nutrition, what NOT to eat, and where the paleo diet came from. This part, Part 2, explains what to eat. And why this style of eating can work, and what I don't like about it. Onward to the paleo food! Plants and animals that you could have picked or killed yourself. Crab, scallops, beef, chicken, scallions, mushrooms, onions, peppers, squash, etc. Vegetables give cuisine taste, flavor, and color. They also fill you up, volume-wise. 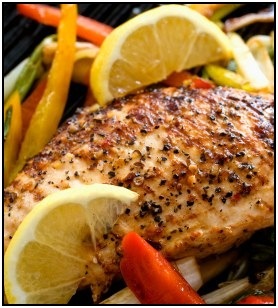 Meat and seafood fills you up by being protein packed. One of the things that influences appetite and feeling satiated is whether or not you have eaten enough protein. Since you might have noticed that even if you eat a heaping pile of leafy salad, you don't really feel 'full'. Most modern fruits are bred to look good and contain buckets of sugar. Quite unlike the fruits our ancestors foraged for during the last hundred-thousand years. Fruits are better than candy bars, but still pack a lot of sugar. Eat some of them, but most of the plants you consume should be vegetables. If you really like fruits, check out Mark Sisson's Primal Diet. Mark's spin on the paleo diet involves eating more fruits than the traditional Paleolithic Diet of Loren Cordian and Arthur De Vany. Don't do the bodybuilding 6 meals a day diet thing. Eat 2 to 3 full meals and leave it at that. Do you think your ancestors had the resources to eat every 3 hours? The intermittent fasting is a part that Art De Vany adds to his spin on paleo food and nutrition. And the practice is gaining some traction in the greater fitness world as well, albeit very slowly. Intermittent fasting is a short fast to help you drop fat. Evolutionarily, we got used to the feeling of hunger. In today's society most people are notin danger of starving, so go to bed hungry once in a while on purpose. Drink water. Not fruit juices or sports drinks, which are little better than sugar water. If you're going to eat fruits, get the fiber and nutrients that are packed into them as well. Now, if you're an athlete your performance will probably benefit from those drinks - though strictly paleo means no sugar drinks. But if you're an athlete, you're probably not overly worried about those sugar drinks turning into fat and breaking your paleo diet. Just Those 5 Simple Guidelines! Why the Paleo Diet Works - And Why I Like It! The paleo diet has a lot of intelligent people supporting it. And it has a number of aspects that help you lose fat, though they might not be obvious. First, it's a relatively high protein diet. As more than a few studies have shown, if you compare equivalent calorie-restrictive diets, the high protein diets correlate to higher levels of fat loss (because of reduced thermodynamic efficiency). Second, protein does not increase insulin levels as much as carbs do, and if you know about insulin and weight loss, then you know that keeping insulin levels low is very important. Also, by eating protein and fats in higher amounts you are training your body to more readily metabolize stored fat for energy, rather than sugary carbs in your blood stream. The 'eat every 3 hours' mantra is associated with a high-carb (particularly high refined-carb) western diet, were you habitually run your body on carbohydrates and then you give it a carby snack whenever you feel hungry (i.e. whenever your blood sugar and insulin levels drop a little and you start using fat for fuel). Even if you're eating according to paleo food rules, you can still get fat. Eating a high protein and high fat diet will help you lose weight if you restrict your calories, but if you just sit on your couch and surround yourself with beef jerky, avocado, and almond butter you WILL get fat. You need to eat fewer calories than you burn (through exercise, metabolic rate, for body heat, etc.) to lose weight. However you lose weight. As I outlined in the previous section, because of hormonal action, that equation isn't *perfect*, but it's as close to perfect as we can get. Also, I've noticed that these diets work less well for smaller people. I'm pretty short (5'3"), and if I eat the same portion sizes that my taller (and fatter) friends and family do, even if it's good paleo, I'll start putting on weight. I've seen some posts by people online who eat lots of nuts and nut butters and fatty meat, and then wonder why they aren't losing weight. Please - they're not eating less. Also, meals with fruits, vegetables, and meats generally take longer to prepare than fast food. You need to put some thought into what you eat - which is the same with any diet that you do. 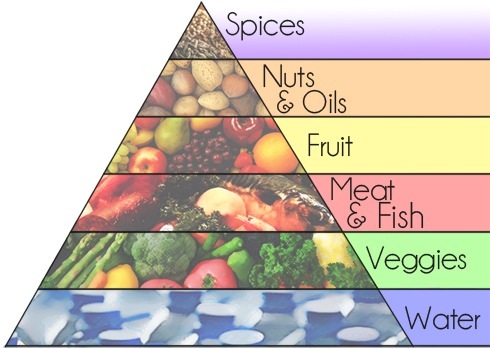 Is Paleo Food and Nutrition For You? Lots of vegetables and a relatively high amount of protein tastes good. But if you want to lose fat, you must eat less. That's simply how it works. • Click here to leave 'Paleo Food Straight Talk - Part 2 -' & go back to the Home-page! 1. Fine, Eugene J and Richard D Feinman. Thermodynamics of Weight Loss Diets. Nutrition & Metabolism 2004, 1:15. < http://www.nutritionandmetabolism.com/content/1/1/15 >. 2. Richard D. Feinman, Ph.D., and Eugene J. Fine, M.D. Thermodynamics and Metabolic Advantage of Weight Loss Diets. Metab Syndr Relat Disord. 2003 Sep;1(3):209-19. < http://www.ncbi.nlm.nih.gov/pubmed/18370664 >.